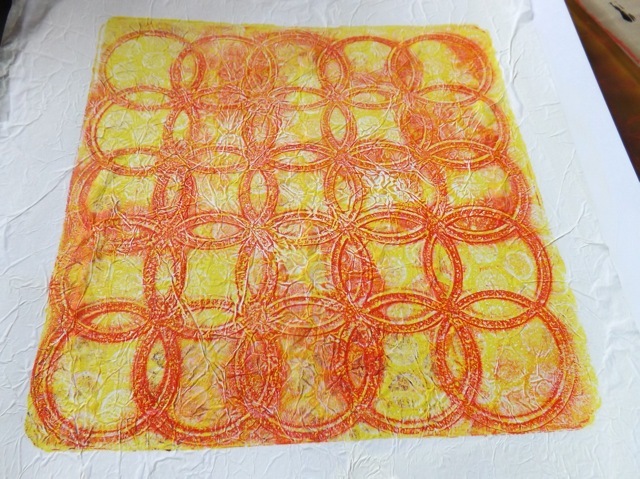 I do a lot of experiments with my Gelli plate. I’m always looking for something new to do with it. I think that’s WHY I enjoy it so much, it’s so ripe for experimentation. But not everything works. Even when it DOESN’T work, it often gives me an idea for future play. Let’s start with a FAIL. 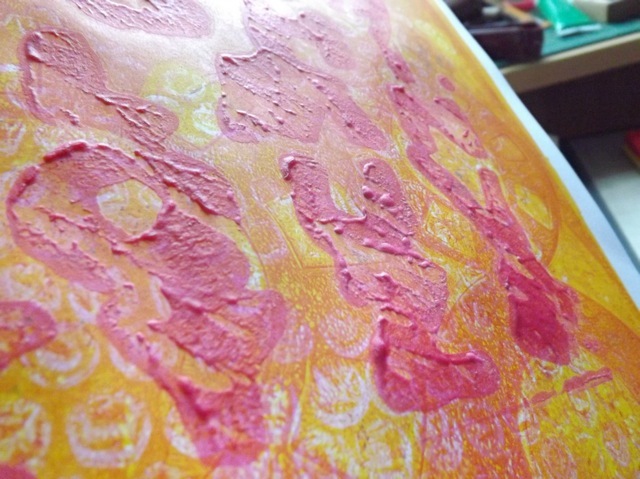 I have had the idea that printing with puff paint could offer some interesting effects, especially as a final, top-layer. I have been looking for commercial Puff Paint at every crafty store I see to no avail. Well, Hobby Craft as some but it costs a lot for a tiny bottle. I went back to an old home-made recipe (1 tbls self-raising flour, 1 tsp salt, mixed with a tiny bit of water and mixed to a creamy paste) but substituted acrylic paint for tempra paint or food colouring (the other mix-ins suggested) because I feared the food colouring would stain the plate. 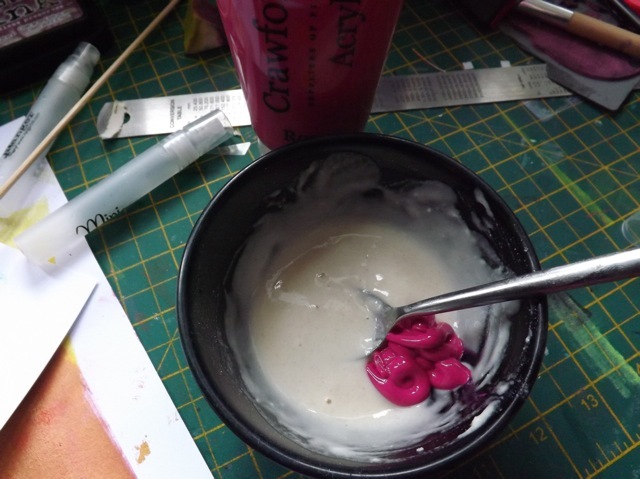 I had no trouble mixing the acrylic in to the other mixture. It was a bit goopy on the plate, but it rolled out OK. The real issue is that the paint is too goopy to get a really clean pull. 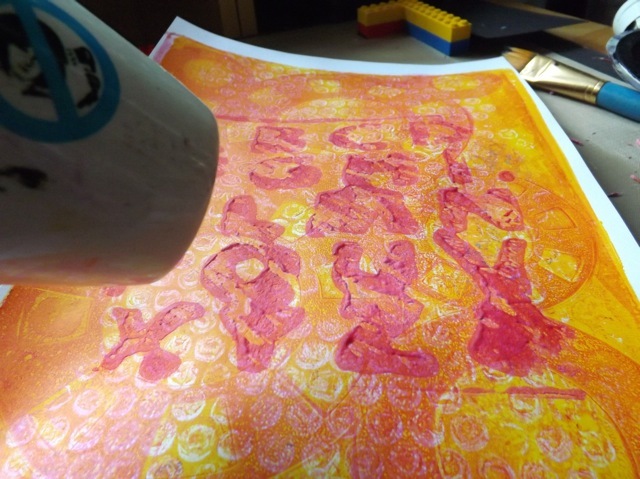 It did “puff” when I heated it with an embossing gun but as the coverage was patchy it wasn’t as uniform a puff as I wanted. 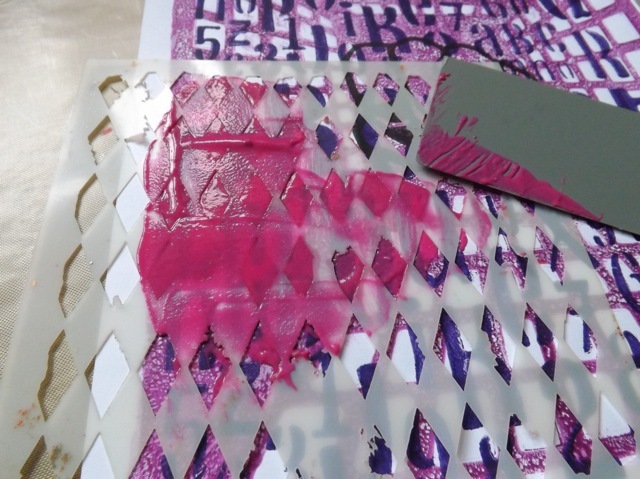 What worked way BETTER was squidging the paint thru a stencil. But really, Why? 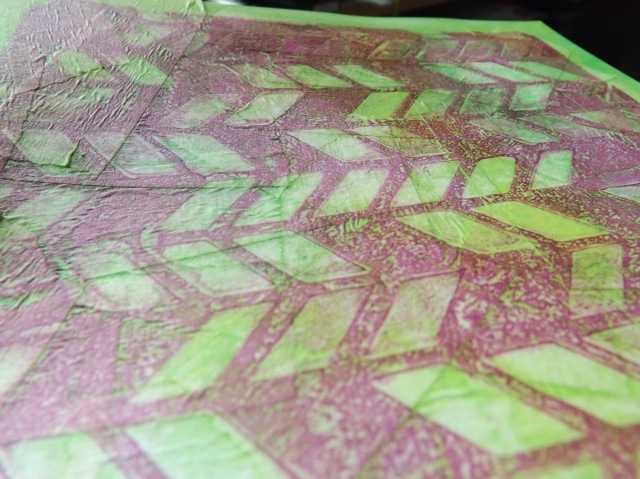 Texture paste, Gesso, or even just thick plain paint give pretty much the same effect. I still am convinced commercial puff paint will work, and I may just have to break down and order some online to satisfy myself one way or the other. Next, and this one did work, I tried an old technique – covering cardstock with masking tape, then pulling the print over that. Really liked that effect. 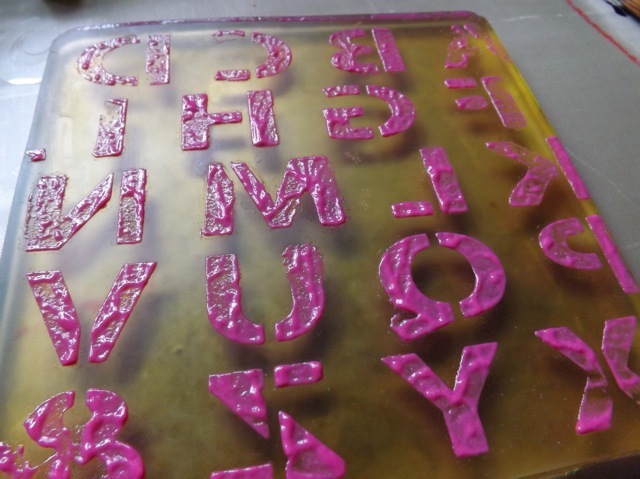 I did worry that the rough surface might not leave me with a good print, but it did. Perfect for ATC backgrounds, I think. 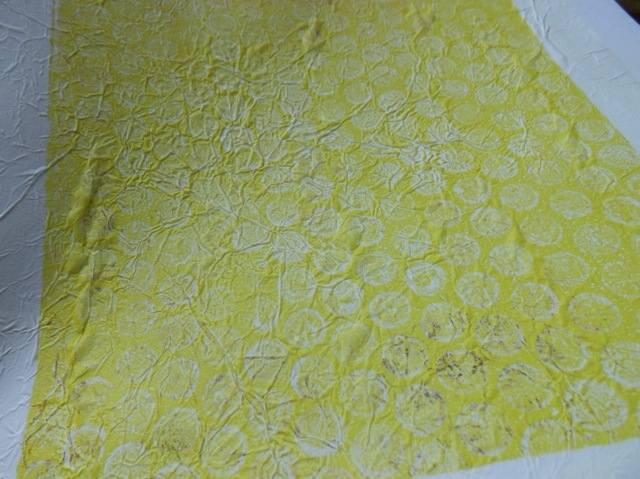 Finally, I thought about the tissue paper cover technique, but tried it with crumpled Deli paper instead. 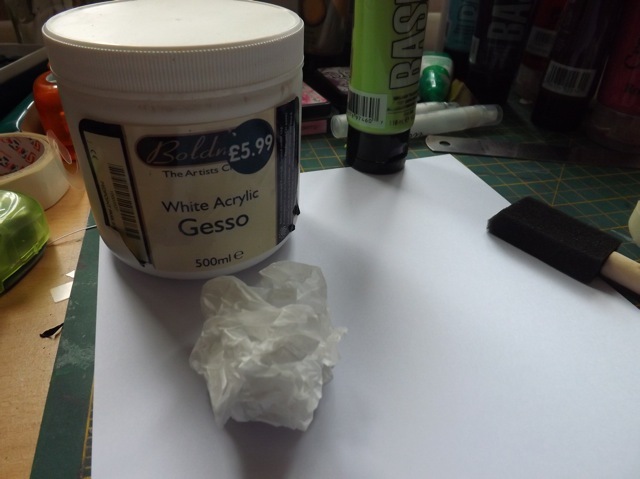 I stuck it with Gesso, but I suspect matt medium might have been better – that, or waiting till it had fully dried. You can see it pulled up a bit with the background pull. 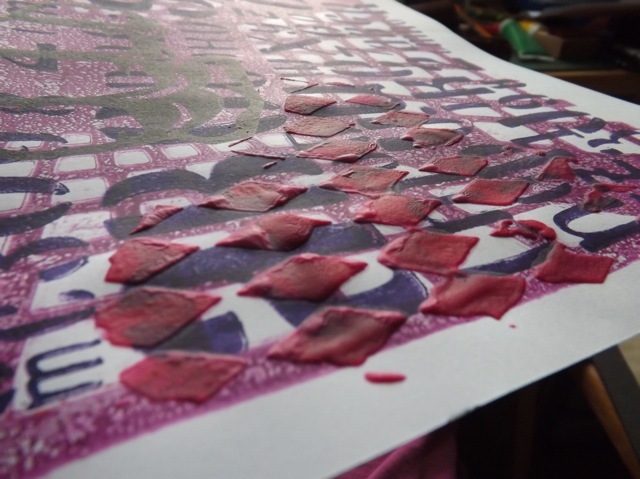 The photo doesn’t show the subtle pattern of bubble wrap texture but it’s there…. But again. the pull on top does still show some interesting texture. 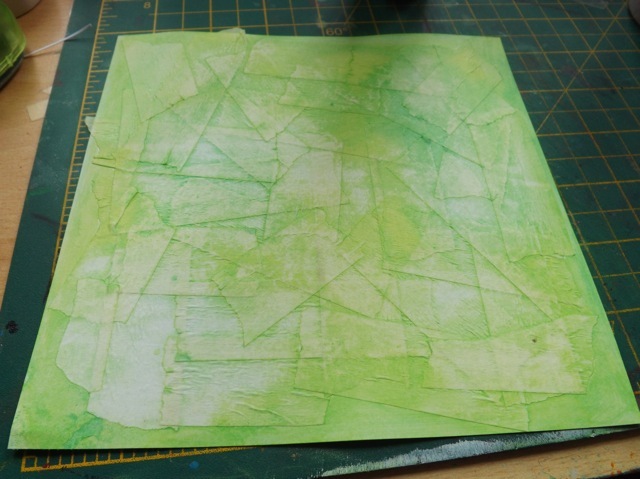 I have a piece of canvas that I tried something on (which did NOT work at all) that I have now covered with crumpled Deli paper and I am going to have a go pulling a print directly on top of that. I have some ideas. 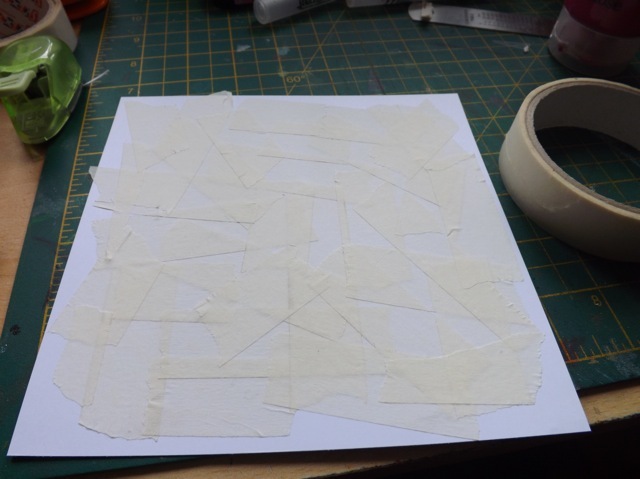 But when you pull on paper, if it goes horribly wrong, you haven’t lost much, just paper, If a canvas goes wrong, well, it’s a bigger loss, so I am taking the time to let it dry fully, and considering exactly what I want to try on top. 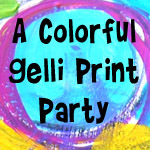 The magic and the mystery of the Gelli, so unpredictable….. 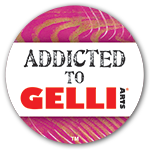 Categories: art, Gelli plate monoprints | Tags: art techniques, Gelli plate, how-to | Permalink. 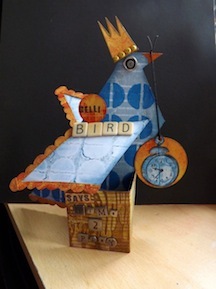 I love all the different experiments you try with the gelli plate, it’s very inspiring! Where do you find deli paper in UK? When I looked it seemed very expensive on line!